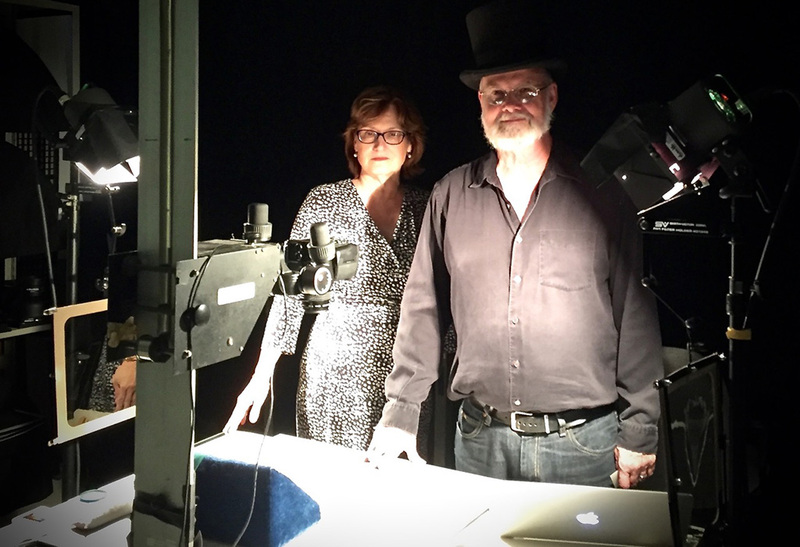 Huntington Library Imaging Center Tour: Lights! Camera! Magic! 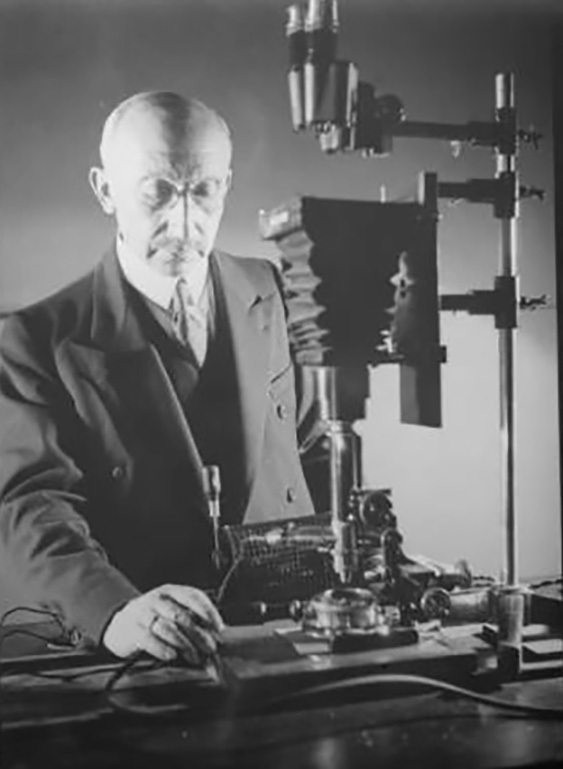 Dr. Lodewyk Bendikson was a pioneer and leader in the development of forensic photography and the head of the photography department of the Huntington Library from 1928 until his retirement in 1943. By way of introduction to the work of Bendikson, Laura Stalker began her presentation with a brief history of the development of the Huntington Library. George Watson Cole, a leader in the library profession, was appointed by Henry Huntington in 1915 as the first librarian and cataloger of the rapidly growing Huntington book collection housed at that time in New York City. The collection was relocated to San Marino, California, upon completion in 1920 of the newly constructed Huntington Library building located on the grounds of the Huntington estate. It was noted that Huntington Library will be celebrating its one hundredth anniversary in 2019. Dr. Bendikson was one of the earliest employees to join the Huntington Library staff in New York in 1916 and, subsequently, he made the move to the new location in San Marino. His early days at the Huntington Library coincided with the rapid development of photographic technology that was beginning to be widely used for document copying. By 1928, he was appointed head of the Department of Photographic Reproduction that eventually evolved to serve the needs of the entire institution including the art gallery and gardens as well as the library. Over the next two decades, Dr. Bendikson continued to make significant contributions to the field of document copying, including use of Photostat copies and microfilm. He also developed pioneering techniques that advanced the use of forensic photography. 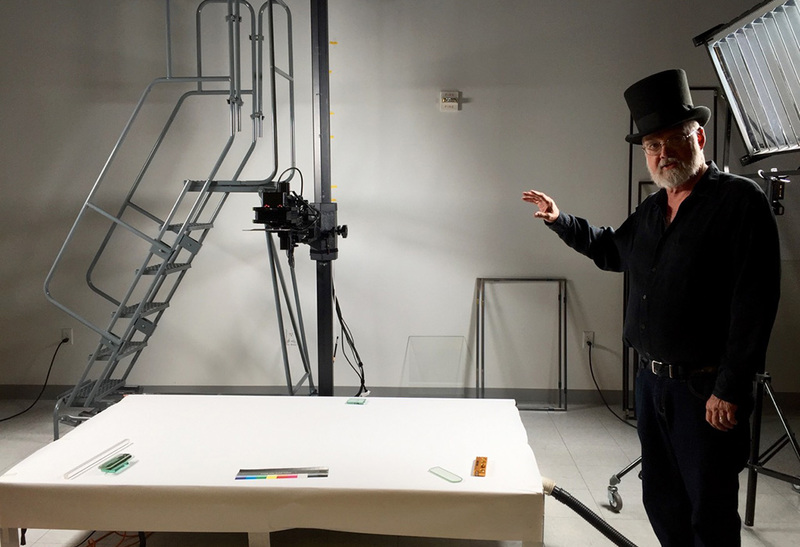 John Sullivan, Head of Imaging, and only the fifth person to occupy this position, demonstrated (with his magician’s top hat in place) several of Dr. Bendikson’s most important contributions. Utilizing the art and science of photography and employing infrared and ultraviolet light sources he was able to display, as if by magic, how “what is hidden may be revealed”. One of the most dramatic of several demonstrations prepared for the tour group involved a page from the handwritten autobiography of Benjamin Franklin, 1771–1790. Most of the text on one of the pages from the Franklin manuscript was obliterated by a large ink spill. Mr. Sullivan was able to demonstrate that the entire original text underneath the ink spill was revealed by employing photography and spectral analysis techniques advanced by Dr. Bendikson and still in use today. 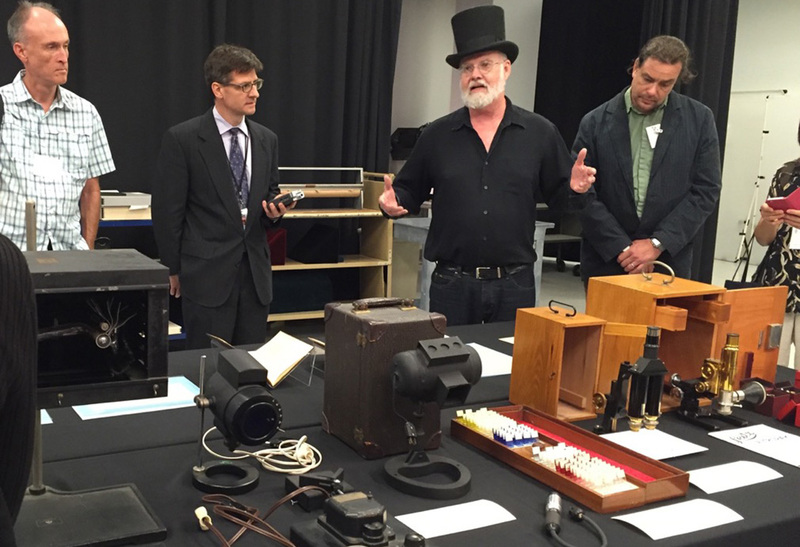 At the close of the presentation and demonstrations, Mr. Sullivan led the group through an exhibit of historical artifacts in use during Dr. Bendikson’s tenure at the lab including tools invented by Dr. Bendikson (e.g. the palimpscope, a light-weight portable ultra violet light source). John also led a tour through the current lab noting that the physical space is partitioned by use of blackout curtains, rather than walls, in order to maximize flexibility of space use. 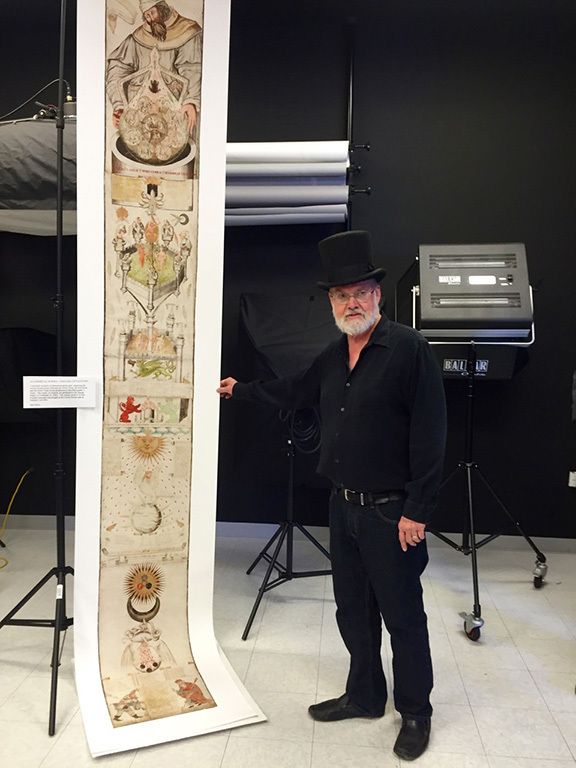 The group observed the large-scale photography set up, a copy of the Ripley alchemical scroll on display, the digital laboratory and office area. John was of the opinion that Bendikson would be pleased and excited by the technology in use in the Imaging Lab today. Vicke Selk is in the process of reinventing herself as a fine design binder and letterpress printer after a long and successful career in higher education administration. She is currently enrolled at the American Academy of Bookbinding in Telluride, Co. where she has studied with Don Glaister, Suzanne Moore, Peter Geraty, and Hélène Jolis. in addition, she takes private lessons with design binder Marilyn Bonaventure in Orange, CA. 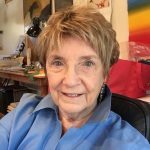 She has taken classes in letterpress printing at the San Francisco Center for the Book and has regularly participated in printing workshops offered by the Scripps College Press. She completed her first commission for a private client in 2014 designing, printing and binding five unique handbound books with full and 1/2 leather design bindings. In 2016 she participated in the Guild of Book Workers California Chapter Member Exhibition currently on display at the Geisel Library at University of San Diego. She is a member of the Guild of Book Workers and the American Printing History Association. She works out of a small studio adjacent to her home in Claremont, CA.